Registration and the subsequent fear of it causes a rift down the middle of the Superhuman as well as the Supervillain community. After successfully foiling the plans of Ricadonna (Daughter of the Dragons #1-6) our bail bondswomen of Nightwing Restoration are approached by the federal government (Iron Man) and asked if they would put together a team to hunt down unregistered villians. To this end, Misty Knight and Colleen Wing add new members Shang Chi, Humbug, Tarantula, Black Cat, Orka, and the mercenary Palladin to their team. They go after the bad guys, and are pretty good at capturing them, partly due to Misty and Colleen’s experience as bail bondswomen. The team is sent in to bust a ring of villains that provide new identities to others who are trying to leave the country. The team realizes it is a set-up and a fight for their lives ensues. Actually, it turns out to be a double-cross, as our heroes have an inside man! 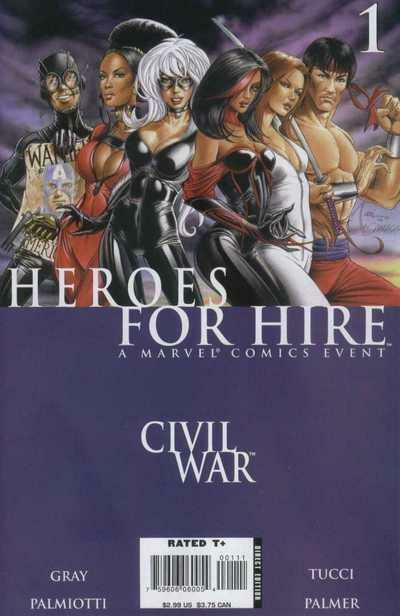 The Heroes for hire team prevails, but questions arise as to why the whole team was not informed about the inside person. Art- Facial expressions are very clear; the colors are very bright but not overpowering; each panel flows into the next. Origin- The name “Hero for Hire” was originally coined by Luke Cage back in the day. He is credited with starting out the whole getting paid idea, and after partnering with Iron Fist, the name became plural. The group has endured break ups and corporate sponsorship, and has always been able to reinvent itself in one form or another. This latest group has been brought together by Misty and Colleen, who got the idea from their days working with Cage and Fist. Cover- the group line up set on the purple background is striking. These definitely look like folks you don’t want after you! Story Significance- this is one of the stories from the Civil War event. The Civil War started when members of the New Warriors attempted to capture 4 Supervillains and one of the (Nitro) exploded, killing hundreds. The government pushed to have every person who called themselves “super” had to register with the government in order to do so. The government side was represented by Iron Man, and the resistance was led by Captain America. The Heroes for Hire being used to hunt down unregistered supervillains just makes sense according to Tony Stark, who mostly just wanted to use the skills of Nightwing Restoration to hunt down Captain America. Misty Knight was one of the hardest critics when Bill Foster (Black Goliath) was killed by the clone of Thor. (Ragnarok of the Dark Avengers).